Coffee is a low-calorie drink. Turkish coffee, however, is made with sugar to be intensely sweet. The calorie content of Turkish coffee will vary with the amount of sugar you like to use. According to the U.S. Department of Agriculture, 1 oz. of strong, black coffee contains 2 calories. That is the equivalent of a single, restaurant-prepared serving of espresso. Make Turkish coffee by adding 1/4 cup of strong ground coffee and 2 tbsp. of sugar to 2 cups of water. When boiled together until it foams, this quantity makes six servings. One average serving of Turkish coffee contains 1 tsp. of granulated sugar. Granulated sugar contains 16 calories per teaspoon. 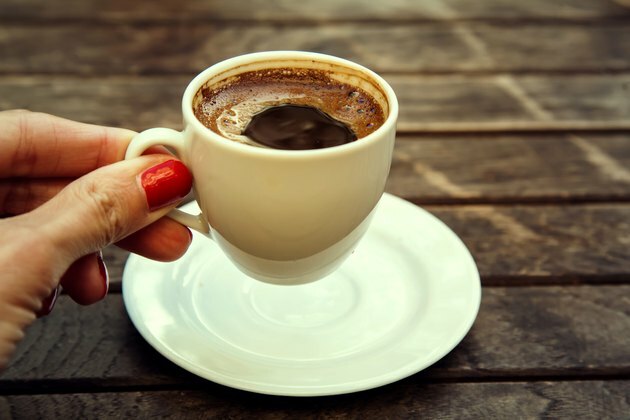 One serving of Turkish coffee contains approximately 18 calories. Although the coffee is sweet, it is served in small cups and contains no cream to add to the calorie count. How Many Calories in a Cup of Coffee With Milk & Sugar?